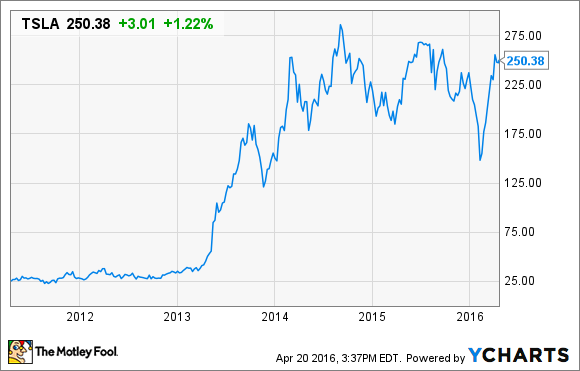 Should Tesla Motors, Inc. Investors Be Concerned About These 3 Challenges? If, and when Tesla can figure these challenges out, investors should still be in for a good ride. This just in: researching, designing, and manufacturing vehicles is a tough business to be in. While that reality has set in with Musk and Tesla Motors (NASDAQ:TSLA), it hasn't stopped the company and its stock from becoming one of the most polarizing stories in recent years. But, make no mistake, Tesla still faces plenty of hurdles. Here are a few near-term challenges for the company that investors should keep in mind. China has been at the forefront of major automakers' business strategies for some time. It's a no-brainer, really, when you consider the massive population and a surging middle class that's accelerating demand for new-vehicles. Beyond that, China's pollution problem has forced the government to spend billions on research grants and subsidies to build out electric vehicle infrastructure, hoping that Chinese consumers would find electric vehicles a suitable alternative to gasoline powered vehicles. The pollution problem isn't going away, and Tesla stands to benefit very heavily from China's push toward electric vehicle adoption. Unfortunately, Chinese consumers have spoken, and it's clear they prefer less environmentally friendly SUVs and MPVs. Just last year, according to Automotive News China, Chinese consumers bought 6.2 million SUVs which was a staggering 52% gain compared to the prior year, and accounted for roughly one-third of all new vehicle purchases in the country. On the flip side, Chinese consumers purchased a meager 189,000 plug-in vehicles which wasn't even a full percent of total new vehicle purchases. Despite China being a no-brainer market for Tesla, with its ongoing pollution problem, massive population, and push toward EVs, Tesla's Model X electric SUV could be the key to unlocking the world's largest automotive market for the company. Investors would be wise to watch how the launch of the Model X in China goes this year. Speaking of the Model X, that brings us to another hurdle Tesla currently faces: production issues. The Model X is finally in the hands of a few lucky consumers and immediately claims of small issues have surfaced. In Consumer Reports' recent article, it mentions a few of the small problems. "One of the wildly designed, upswinging "falcon wing" rear doors failed to close, then later didn't sense an overhang and bonked into it, leaving a ding in the door. The driver's door failed to open, except from the inside. The driver's door window wouldn't motor down properly, until it dislodged a piece of chrome stripping that was restricting its progress. And, continuing a trend seen with many Model S sedans, the huge infotainment screen in Karpf's SUV has frozen repeatedly." Other complaints include balky doors that occasionally aren't aligned properly, less than perfect paint-spray quality, sheet-metal panel gaps and Tesla has also recalled 2,700 Model X units for a third-row seat latch that did not fasten as intended. On one hand, you have a vehicle that consumers are paying a hefty price tag for, and these aren't issues you'd find in a similarly priced luxury vehicle, that's for sure. On the other hand, some of these issues are to be expected from a brand-new model and Consumer Reports even goes as far to say it recommends against buying any vehicle in its first year of production. Ultimately, Tesla is a young automaker, and manufacturing vehicles while meeting deadlines and accelerating production capacity isn't easy, it's rather difficult. Investors can hope to see these issues dwindle as time goes on, but the main thing to watch is that Tesla continues to fix these issues while keeping consumers happy with the experience overall -- and so far, so good on that front with 98% of owners saying they'd buy from Tesla again. Speaking of customer satisfaction, Tesla's execution with the Model 3's timing will be critical to helping consumers receive a $7,500 credit. America's plug-in vehicle tax credit has helped entice consumers to make the plunge into purchasing an expensive Tesla vehicle. All of Tesla's vehicles qualify for the max $7,500 credit, but it's about to get tricky going forward when Tesla's Model 3 hits the pavement. That's because once an automaker sells 200,000 vehicles in the U.S., a phase-out of the tax credit begins. Tesla will probably cross that 200,000 level in 2018 after deliveries of the Model 3 begin. That leaves a possible scenario for unhappy customers not receiving a $7,500 credit while another person purchasing the same vehicle, only at a slightly different time, will still receive the credit. So what's Tesla to do? It's likely going to attempt to time things in such a way that the maximum amount of people receive the credit -- here's how. Technically, the $7,500 credit isn't phased out until the end of the quarter after the quarter in which the threshold is passed. In theory, Tesla could pass that threshold on the first day of a new quarter and then have nearly half a year to optimize the number of people receiving the full credit for purchasing a Tesla vehicle. That will certainly add a level of additional difficulty and orchestration to an already strained manufacturing situation, but it's something Tesla will likely need to do for its consumers. It should be noted that by the time this hurdle arrives, the EV tax credit could be extended to help further the push towards EVs, only time will tell. Ultimately, few companies are as polarizing as Tesla as it continues riding a wave of changing attitudes toward electric vehicles. Tesla has great products for the most part, a recognizable brand image, and loyal consumers. If it can unlock a ton of potential in the Chinese market, shore up some of its manufacturing problems, and keep consumers happy, this fun ride will be far from over.